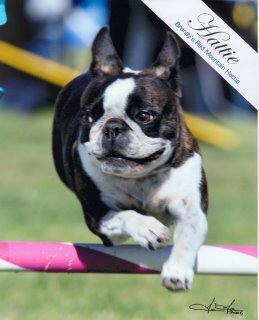 Hattie is the first Boston Terrier with an MXF title!!! 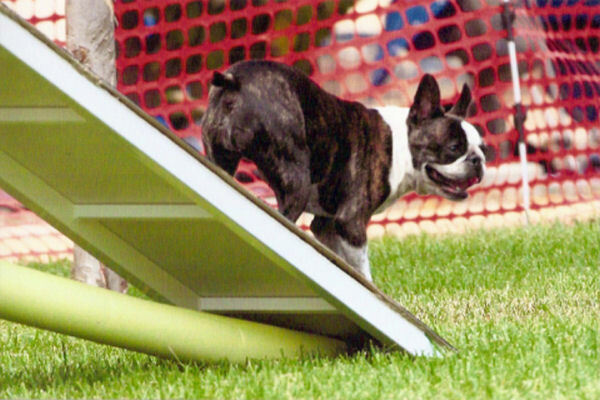 At Preble Field on 8/2/2015 Hattie Double Q'd, 4th and 2nd Place, at the German Shepherd Club of San Diego County AKC Trial ! and Q'd 2nd Place again in MPSTD the next day! 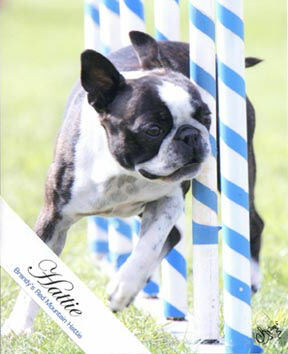 Hattie took a 2nd-Place Q MPSTD (13 PACH pts.) 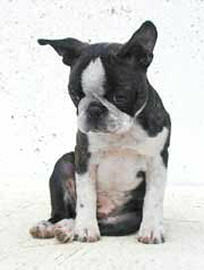 on Saturday and a lst-Place Q MPSTD (12 PACH pts.) on Sunday!! and Q'd 2nd Place in MPJWW on Sunday. 2nd Place, 20 PACH points! Hattie Double Q'd (2nd Place)! Saturday Master Preferred Jumpers with Weaves 2nd Place 8 PACH pts. Saturday Master Preferred Standard lst Place 22 PACH pts. 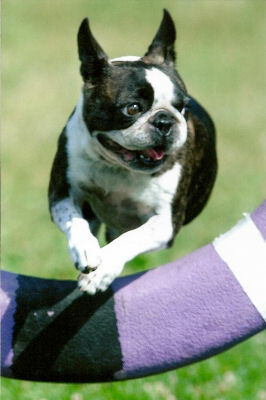 Sunday Master Preferred Jumpers with Weaves lst Place 14 PACH pts. Sunday Master Preferred Standard lst Place 20 PACH pts. Master Preferred Jumpers with Weaves 2nd Place 15 PACH pts. 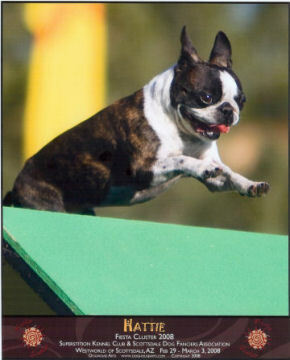 Master Preferred Standard 1st Place 20 PACH pts. Master Preferred Jumpers with Weaves 1st Place 12 PACH pts. 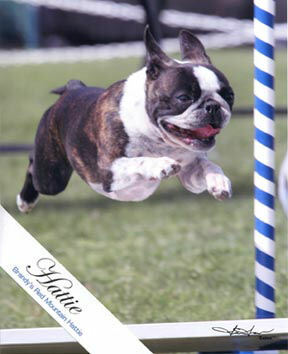 Master Preferred Standard 1st Place 18 PACH pts. Master Preferred Jumpers with Weaves 1st Place 14 PACH pts. 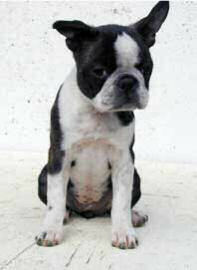 Master Preferred Standard 2d Place 23 PACH pts. 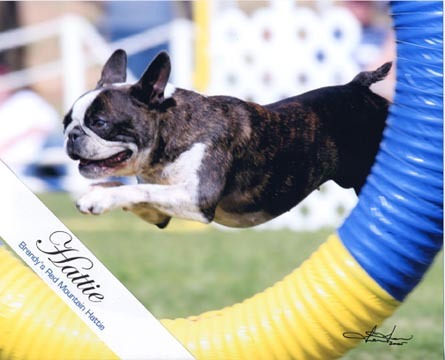 Hattie Double Q'd at the SDRRC AKC Trial 3/23/2013 at Liberty Station with 11 MACH pts. in MJ/W and 21 MACH pts. 4th-Place Q in MSTD! 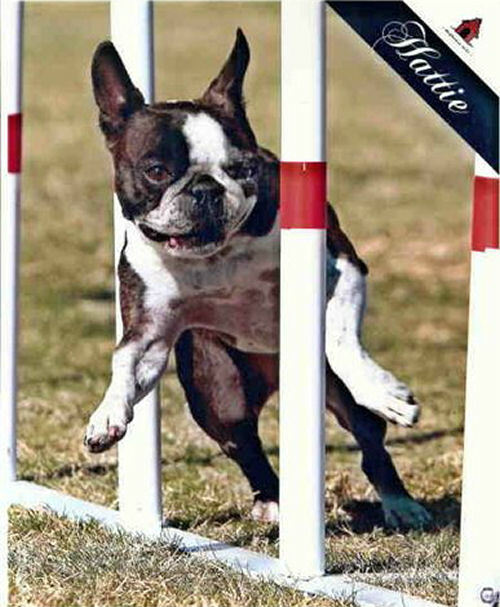 Hattie Double Q'd on Saturday, 2/9/2013, at the American Chesapeake AKC Trial at Liberty Station with a 3rd-Place Q in MJ/W and a 4th-Place Q MSTD! 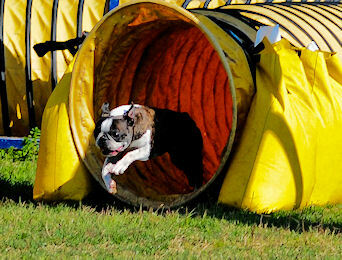 On Saturday, November 24, 2012, at the Southwestern Rottweiler Club of San Diego AKC Trial at Rohr Park, Hattie Double Q'd! 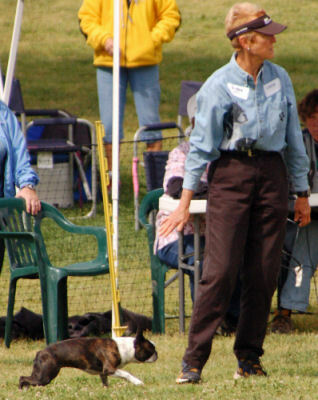 Despite the heat and humidity, Hattie Double Q'd at the German Shepherd Dog Club of San Diego AKC trial at Rohr Park on Saturday, 9/22/2012, with a 3rd Place in XBJ/W! 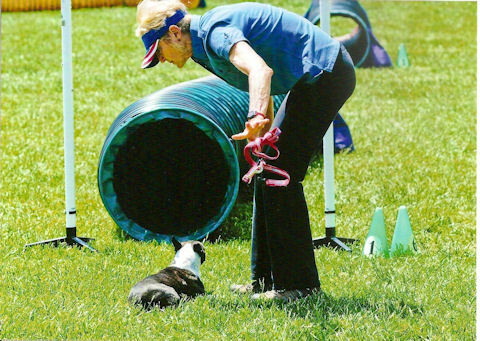 At the hot and humid American Chesapeake Club AKC Trial at Rohr Park on August 18 and 19, 2012, Hattie Double Q'd Sunday (XBJ/W 3rd Place 12 MACH pts. and XBSTD 3rd Place 22 MACH pts.). 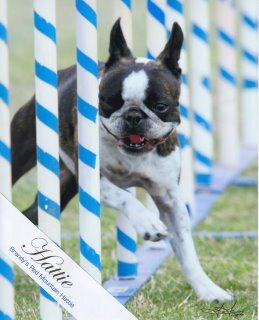 On July 28-29, 2012 at the Aztec Doberman Pinscher Club of San Diego Trial at Liberty Station, Hattie Double/Double Q'd with 9 MACH pts. 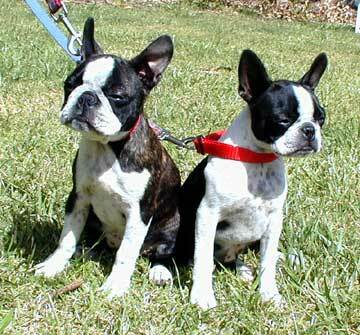 J/W both days, 20 MACH pts. 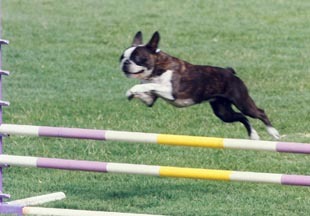 STD 3rd Place Saturday and 22 MACH pts. STD 4th Place Sunday! 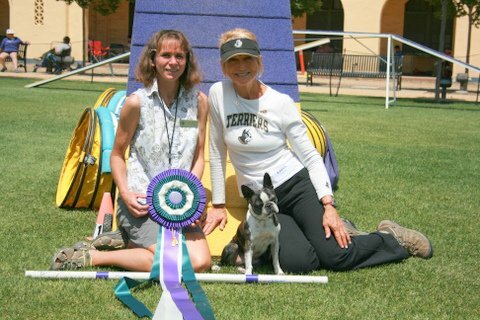 On July 13-15, 2012 at the Papillon Club of Southern California at the Brookside Equestrian Center in Walnut, CA in heat and humidity, Hattie Double Q'd on Friday with a 3rd Place and 20 MACH pts in Standard and 13 MACH pts in J/W and again on Sunday with 21 MACH pts in Standard and 10 MACH pts in J/W adding 16 MACH pts. in J/W on Saturday. 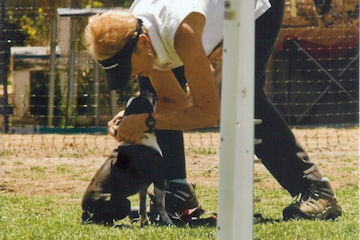 At the Bichon Frise Club of San Diego AKC trial, Liberty Station, June 15 thru 17, 2012 Hattie Double/Double Q'd on very challenging courses! 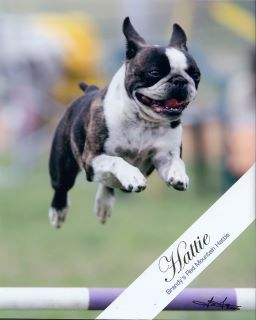 At the Kennel Club of Pasadena AKC trial on June 2 and 3, 2012, Hattie Double Q'd with 32 MACH pts! 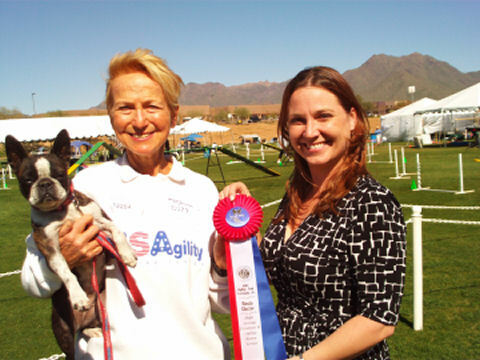 On May 19, 2012 Hattie aka Hottie got her 20th Double Q earning her Master Agility Champiohship title at the San Diego Rhodesian Ridgeback Club trial in Liberty Station. She continued her streak earning her 21st Double Q the next day. 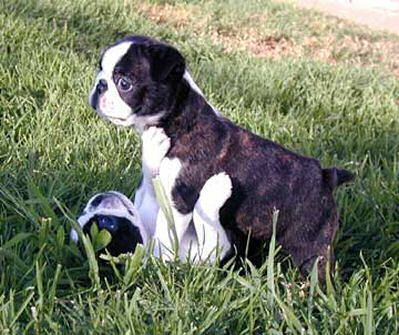 Like father, like daughter... CH. MACH GERONIMO! 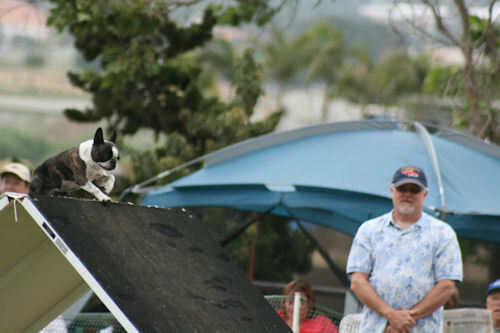 In rain, wind and hail at the Agility Club of San Diego AKC Trial, Rohr Park, March 17 & 18, 2012, Hattie Double/Double Q'd #18 and #19: XBJ/W 3rd Place (15 MACH pts. ), XBStd. 3rd Place (21 MACH pts. ), XBJ/W 2d Place (8 MACH pts. ), XBStd. lst Place (23 MACH pts.)! On March 10 & 11, 2012, at the Keeshond Club of Southern California AKC Trial, Walnut Grove Park, San Marcos, Hattie Q'd in XB Standard both days (4th and 3rd Place) with a Double Q on Sunday! Hattie Double Q'd with two 2nd Placements (14 MACH points in XB J/W and 18 MACH points in XB Standard) at the American Chesapeake AKC trial on February 11, 2012. On Sunday, Hattie won the 12" XB Standard (19 MACH points)! Hattie was awesome on Sunday with Q and a 3rd place in Standard. She gave me my start lines and contacts. My handler error in jumpers robbed her of her Double Q.
I got into overdrive after running Nell before Hattie and sent Hattie out too far when layering! 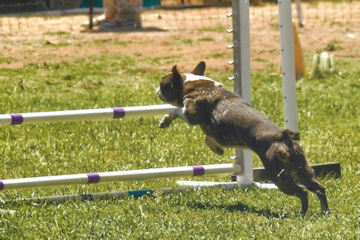 Hattie Double Q'd on Saturday, December 10, 2011 with a 3rd Place (14 MACH pts.) in Jumpers with Weaves and 3rd Place (24 MACH pts.) Standard! 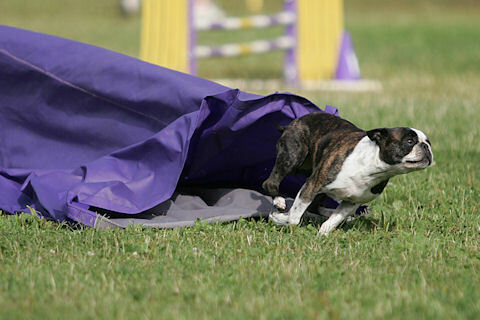 On Sunday, December 11, 2011, she got 2nd Place (.12 seconds away from lst Place) with 25 MACH pts. in Standard, just missing another Double Q due to the last bar down in J/W (the triple). 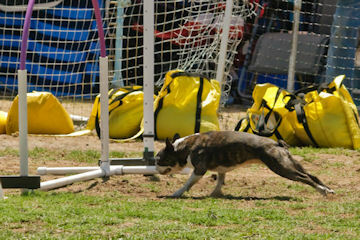 At the German Shepherd Dog Club of San Diego AKC Trial on September 25, 2011, at Rohr Park, Hattie Double Q'd with a 3rd Place Q (22 MACH points) in XStandard! 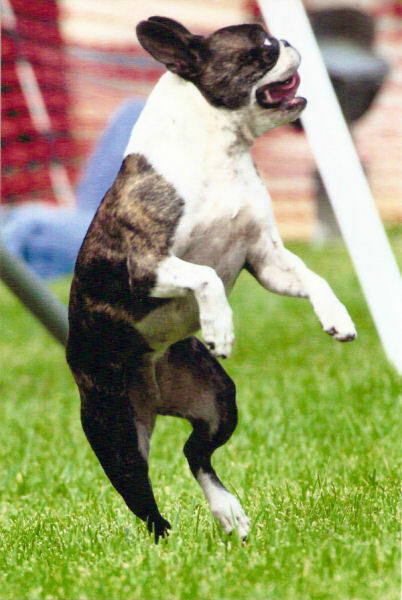 On July 31, 2011, at the Aztec Doberman Pincher Club of San Diego AKC Trial, Liberty Station, Hattie Double Q'd with a 4th Place in XB Std., 25 MACH points! 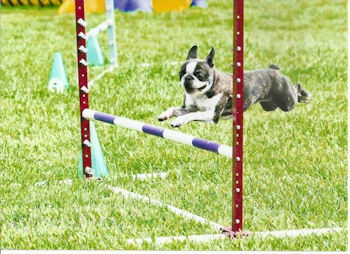 At the hot/challenging Agility Club of San Diego AKC trial, July 9 and l0, 2011 at Rohr Park: on Saturday, Hattie won the 12" XB Jumpers/Weaves class for 21 MACH points. 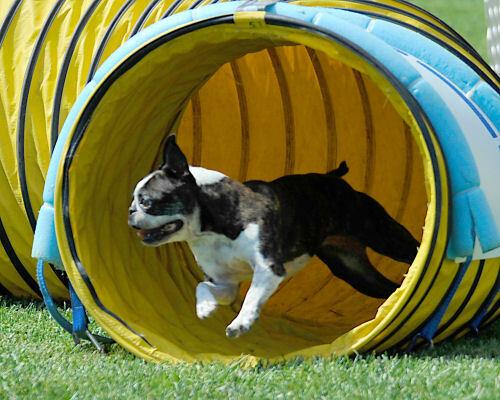 On Sunday, July 3, 2011, at Liberty Station (hot days/challenging courses at the Golden Retriever Club of San Diego AKC trial), Hattie Double Q'd. Friday XB J/W 3rd Place 15 MACH pts., XB Standard 2nd Place 33 MACH pts. 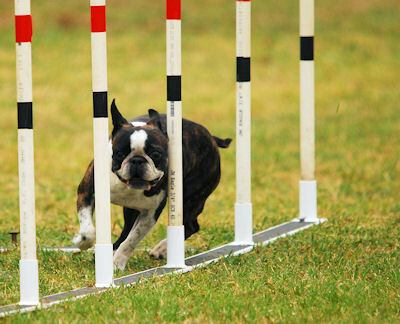 and Saturday XB J/W 3rd Place 13 MACH pts., XB Standard 3d Place 20 MACH pts. At HVOC on Sunday, March 27, 2011, at the Bichon Frise Club of San Diego/San Diego Rhodesian Ridgeback Club AKC trial Hattie Double Q'd: JWW Class 2d Place (3.04 seconds from lst) with 24 MACH pts., Standard Class 2d Place (.31 second from lst) 37 MACH pts. 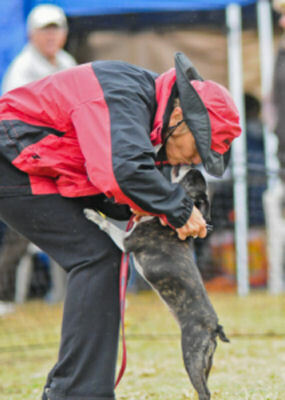 Picture taken at the rainy UDAC November 21, 2010 NADAC trial. 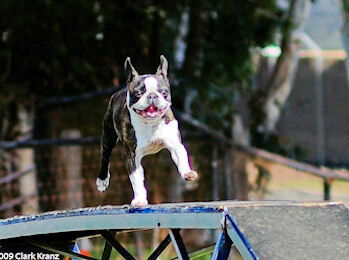 On October 3, 2010 At the Aztec Doberman Pincher Club AKC trial, Hattie Double Q'd earning 73 MACH points. 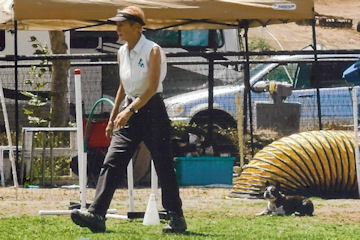 At the San Diego Rhodesian Ridgeback Club, March 27 and 28, 2010, Hattie "Q'd" with a 2nd Place on Saturday and a lst Place Q (36 MACH points) on Sunday in Excellent B J/W 12". 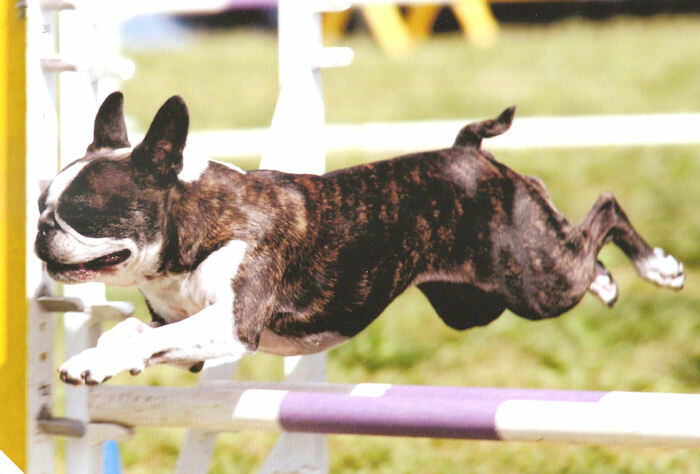 At a hot Fourth of July 2009 celebration at the Agility Club of San Diego AKC trial in Rohr Park, all-star Hattie won the 12" Excellent B Standard class earning 50 MACH points. At the UDAC NADAC trial May 30 and 31, 2009, at Skydance Ranch, Oceanside, CA, Hattie came away with lst and 2nds and two titles, WV-N and TN-N.
At the Golden Retriever Club of San Diego Agility Trial on Sunday, October 26, 2008, at Rohr Park, Bonita, CA; Hattie won Excellent B Jumpers/Weaves 12" (against 19 competitors) in 29:47 seconds (Standard Course Time was 46 seconds) earning 32 MACH pts. 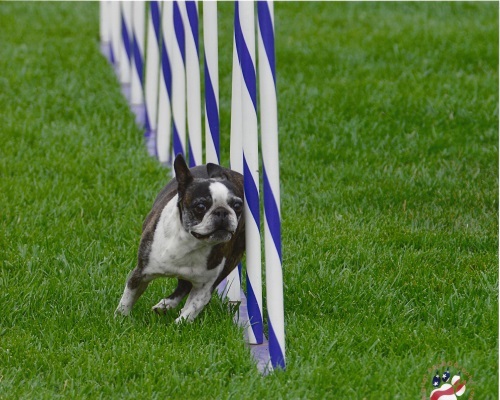 (She was less than a second behind the overall fastest time winner in the 8" class.) 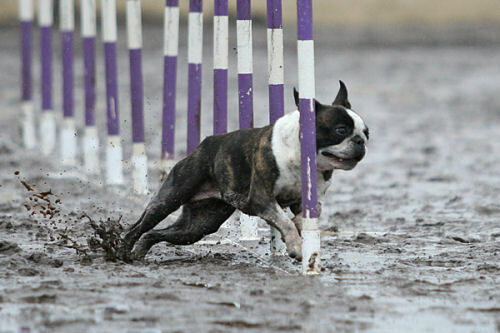 There were very few qualifiers in all heights. 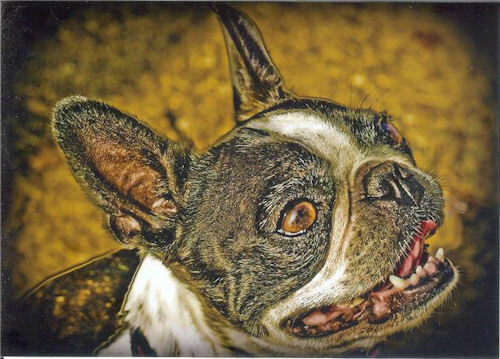 On a hot/muggy Sunday, July 27, 2008, Hattie won (42 MACH points)the very challenging 12" Excellent B Standard Class of 18 at the Aztec Doberman Pinscher Club of San Diego AKC Trial, Rohr Park, with Sandy without her bionic left knee! 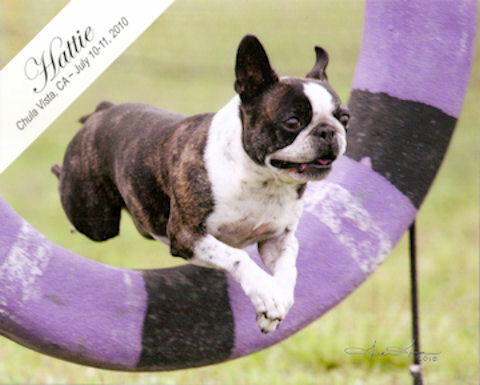 Hattie achieved her AX title with a lst-Place Q in 12" Excellent A Standard and also was awarded High Scoring Excellent B Agility Boston Terrier by Meghan Thomas of the Arizona Boston Terrier Rescue. 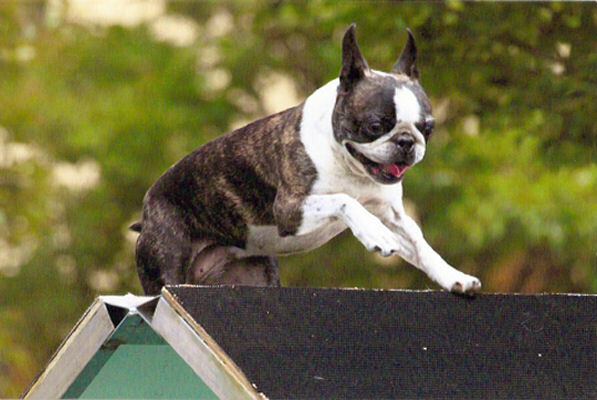 Highlights of the Rainy/Muddy Outdoor AKC Silver Bay Kennel Club Trial on February 23 and 24, 2008 in Del Mar: Geronimo and Hattie are proven "mudders"; Hattie took a lst in Saturday's Excellent B FAST (3l:03 76 SCT 35 with the most points in the least amount of time all jump heights) and another lst Place on Sunday! Hattie turned heads at the West Coast Cocker Spaniel Club at Industry Hills Expo Center 1/5/2008 by being one of very few qualifiers in all classes for Excellent B FAST! Hattie took a lst in the 12" class! 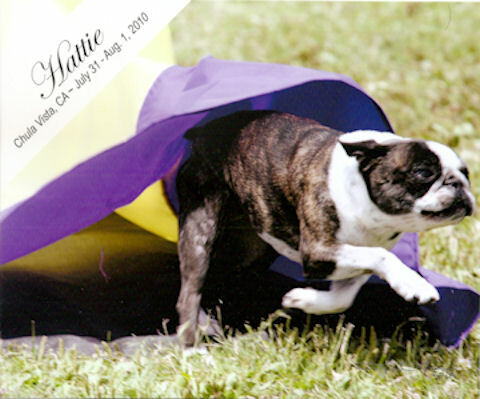 On Saturday, October 27, 2007, while recovering from the effects of the Witch Fire, Hattie won and titled in the Excellent A 12" FAST class (31.42 SCT, 78 points). On Sunday, October 28, Hattie won the Excellent B 12" FAST class moving Geronimo (dad) to 2nd Place. At the Golden Retriever Club of Greater Los Angeles' three-day Labor Day AKC Trial in over 105-degree temperatures, Hattie took a lst-Place Q the last day in Excellent 12" Standard! 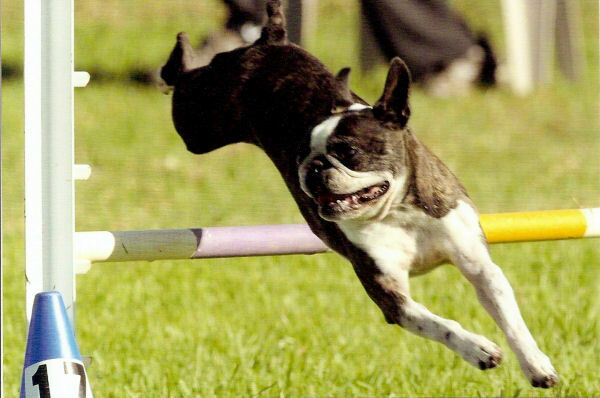 Highlight at the AKC Southern California Portuguese Water Dog Club Trial 2/4/06: Hattie winning and titling (AXJ) in the Excellent A Jumper w/Weaves 12”: Yds: 133 SCT: 41 Hattie’s time: 28.42 (fastest Qualifying time in the 12" Excellent Jumpers w/Weaves classes totaling 96 dogs). 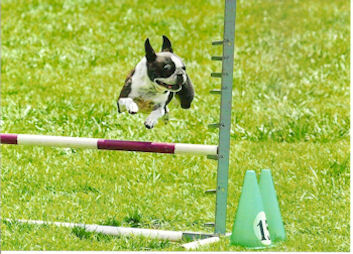 The overall fastest time for 1st-Place Qualifiers at all other jump heights was only 2-3 seconds less. 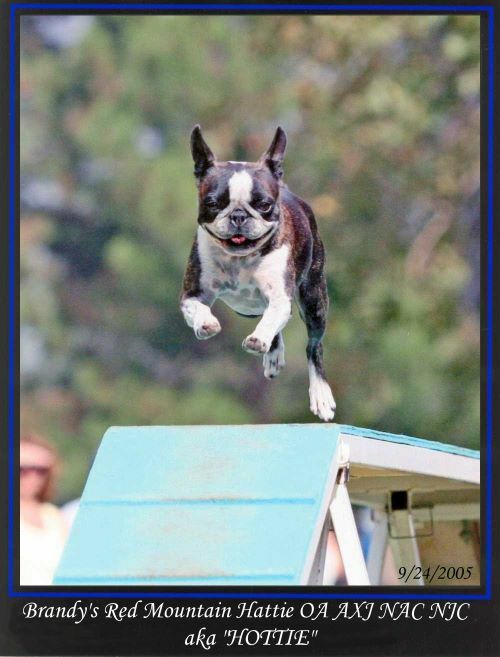 At the Golden Retriever Club of San Diego AKC Trial on October 28 and 29, 2006, Hattie attained her Master Excellent Jumper (MXJ) title by Qualifying both days in the 12” Excellent B Jumpers w/Weaves (class of 15) with a lst Place on Sunday and 28 MACH Points! 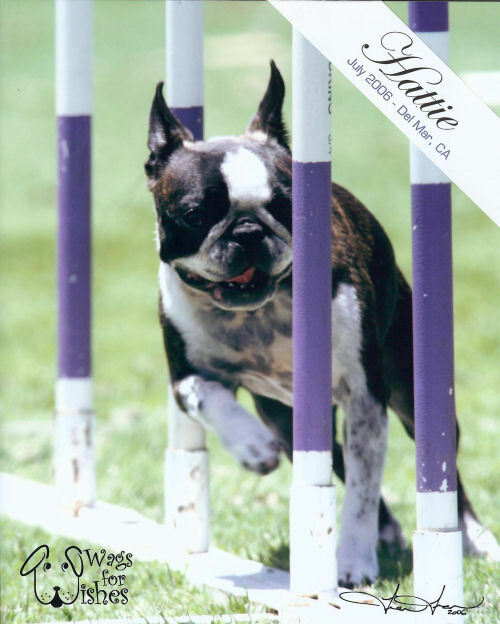 Hattie in her first trial at Wags for Wishes in June 2004 was 1st place & Q'd in Novice B JWW on Friday and 1st Place & Q'd Novice B JWW on Saturday. 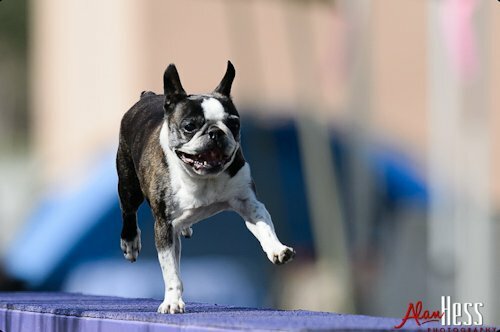 She earned a first place and her NAJ title Sept. 11 at the ACD trial in Del Mar and was the only Qualifier in Novice B Standard 12” on the same day.